Western Digital Blue WDS100T1B0A 1TB Tinjauan Para Ahli - Baca Tinjauan dan Beli Lebih Pintar secara Online. Keputusan: The WD Blue is a decent SSD that may be worth the investment when the price comes down. Keputusan: The WD SSD has finally making a debut in the SSD market, a year after the acquisition of manufacturer SanDisk back in October 2015. WD offers 2 series for its WD SSD as of now, the WD Blue and WD Green in the form of 2.5" SATA drives and M.2 drives. 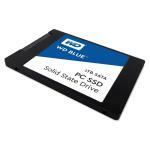 Keputusan: Western Digital's WD Blue SSD is the everyman's solid state drive. Keputusan: Western Digital (WD) is well-known in the storage industry for its reliable range of hard disk drives (HDD). On 11 October 2016, SanDisk (now a WD company) released the WD Blue and Green line of SSDs to the market. Keputusan: A mere six months ago Western Digital made the bold move of purchasing SanDisk, one of the most recognized companies in the solid state storage market. Much like Toshiba's purchase of OCZ, this was done in an effort to reinvigorate their own solid state drive lineup. Keputusan: I have two of these drives, one on a Windows 10 system and the other on a Windows 7 system. Reduced boot times by about 50-60 percent. Easy install as long as you know your way around computer internals. Keputusan: I used this SSD to improve the general performance of an older Core i7 desktop. Improved boot time and generally improved speed of disk read and write operations was achieved. Not as fast Samsung EVO but still fast. Keputusan: On the same motherboard, CPU, and RAM, Samsung EVO 850 is definitely faster albeit Samsung EVO has 10 GB less storage. But overall, it is still fast. Keputusan: I am very happy with this item. My boot-time, for example, was over 40secs. Now, since installing WD, it is around 30secs! Speed Improvements all round, An excellent piece of equipment! Keputusan: Win 10 installation of this SSD has a load time now of about 15 seconds, so much better than the old HDD performance. Keputusan: Good SSD. If you are thinking about upgrading your mechanical drive, it is well worth it. This is a great product at a good price for a computer that needs an extra little punch of speed. Even if it is a quot;operating system onlyquot; drive for your computer, you will not be disappointed. Keputusan: The WD Blue SSD has a great performance to price ratio however, it seems to have some firmware compatibilities with certain Mac EFI firmwares. This drive was ordered to be installed as a second drive in a MacBookPro 15 (mid 2012) but it seems to be incompatible with that Mac EFI firmware. Pros: I installed this drive in a mid-level computer as the Windows system drive C: along with a 500GB WD Blue standard hard drive as the user drive D: as a cheaper alternative than my friend having to get a new computer. The boot time is what most people appreciate most. Keputusan: I highly recommend these drives in whatever size you need, they have not failed on me yet and are extremely fast! Keputusan: Its a Western Digital SSD, you know what your getting. Fast enough, large enough, but most importantly reliable and well priced. Couldnt ask for much more from anyone. Keputusan: I just bought this, but it works, and it cloned without any trouble. Can't complain at $189 compared to Samsung at >$225. I think the Samsung 850 rates a little faster, but compared to the 5400rpm drive installed in my laptop, this is just fine.